Car Caddy Will Catch and Hold Cell Phones, Pens, Loose Change and More! Car Caddy Organizer fits between your front seats and console to hold and catch all your stuff! 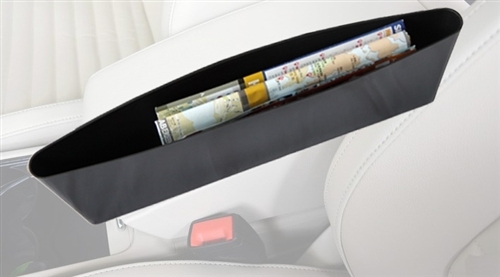 The Car Caddy Organizer fits perfectly between your front seats and the center console to stop drops from going between the cracks. No more losing dropped or spilled items like coins, jewelry, keys, or pens- now they'll fall right into your Car Caddy Organizer. Not only will the Car Caddy Organizer stop drops it creates extra storage for holding cell phones, sunglasses, maps, loose change, pens, and more.